Non-retail Japanese release. 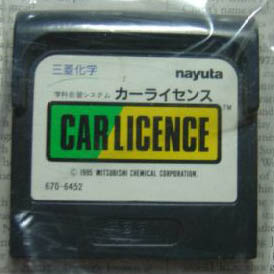 The exact story behind this cartridge is yet unknown. Seems to be an internal cartridge for Mitsubishi Chemical. Contains textual driving lessons, database of signs, and driving licence test questions. Also contains a minigame, titled "Brocked Street" (they meant "Blocked Street").